(March 26, 2004) -- A recently released report by LB City Auditor Gary Burroughs, which said City Hall's Queen Mary operator (Queens Seaport Development, Inc. or "QSDI") owes roughly $2 million in rent, did not disclose that Mr. Burroughs gave written confirmation (text below) to a prospective lender to QSDI in Nov. 2002 that the City Council had approved a proposed lease amendment and was in the process of preparing a written amendment to the ground lease consistent with millions of dollars in rent credits that would be allowed QSDI. The lender's QSDI loan transaction took place...but the lease amendments did not...and now City Auditor Burroughs' written representations have become a key issue in whether QSDI owes City Hall rent. Asked by LBReport.com why his report -- which the City Auditor described as "review procedures" -- didn't mention his own written representation on the Nov. 2000 lender's letter, City Auditor Burroughs said his review procedures covered the last official document signed which is the 1998 QSDI lease. Mr. Burroughs further stated that his report did cite a publicly released memo by City Hall CFO Robert Torrez, approved by (then acting) City Manager Jerry Miller, that accompanied a November 12, 2002 Council agenda item by which the Council authorized the City Manager to execute an amendment to the QM's Lease and Operations Agreementy, Adjacent Lands and Improvements, Dome and Queen's Marketplace in a form substantially as delineated in the Nov. 12, 2002 management memo. "The November 12 [management] memo was covered in our report and in my view it is the more authoritative document. It covers items that were considered in [the lender's letter]. 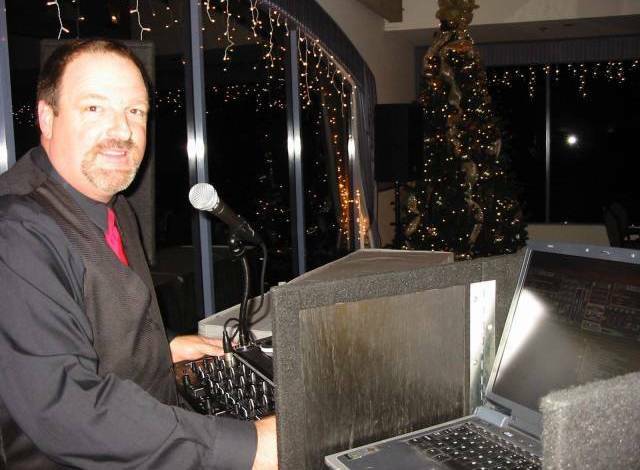 To me, the items are in the staff report that was sent to the Council and the Council voted on it," Mr. Burroughs said. In the public interest, LBReport.com posts below city management's Nov. 12, 2002 memo, and the salient text of QSDI's lender's Nov. 12, 2002 letter containing the confirmatory representation by City Auditor Burroughs. The circumstances under which the City Auditor signed his name to the representations, and on whose authority, have not been publicly discussed by the City Council. The LB City Attorney's office takes the position that Mr. Burroughs' representations did not bind the City of LB. QSDI President and CEO Joe Prevratil says otherwise and denies owing City Hall the $2 million percentage rent. Any lease amendment will now almost certainly require negotiation and resolution of the multi-million dollar dispute. On March 23, 2004, City Auditor Burroughs presented his report to the City Council. Mr. Prevratil did not attend but provided a letter outlining his position to the Mayor and Councilmembers. The existence of City Auditor Burroughs' signature on the Nov. 12, 2002 QSDI lender's letter was first reported by Press-Telegram reporter Jason Gewirtz. Following the City Auditor's March 23, 2004 presentation of his office's QM rent report, LBReport.com asked Mr. Burroughs to provide a copy of the Nov. 12, 2002 lender's letter that contained his signature and Mr. Burroughs did so. Mr. Gewirtz's PT reporting followed Public Record Act requests by LB activist (now Missouri resident) Traci Wilson-Kleekamp who had requested records concerning the rent credits. Ms. Wilson-Kleekamp, who has since sued City Hall seeking release of documents requested, said QSDI lender's letter with Mr. Burroughs' signature had not been provided to her. 1. That there is a $1.5 million rent credit, as referred to in the staff report, which may be taken against any rent coming due under the ground lease. 2. That...there will be a rent credit, in the approximate sum of $2.2 million, related to the chillers, substation, and steam plant, which may be taken against any rent coming due under the ground lease. 3. That QSDI will be entitled to the 9% rent credit for the capital improvements done in connection with [certain capital improvements] as well as the Waterfront Property, so long as such credit is not duplicative of some other credit. 4. That QSDI may withdraw $700,000 from the Queen Mary Reserve Account, plus $390,000 in additional rent to be paid by it, upon presentation of satisfactory evidence to the City that $1,090,000 has been previously expended for "on ship" capital improvements. [in all caps in original] THIS WILL CONFIRM THAT THE CITY COUNCIL HAS APPROVED THE PROPOSED LEASE AMENDMENT AND THE CITY IS IN THE PROCESS OF PREPARING A WRITTEN AMENDMENT TO THE GROUND LEASE CONSISTENT WITH THIS LETTER. 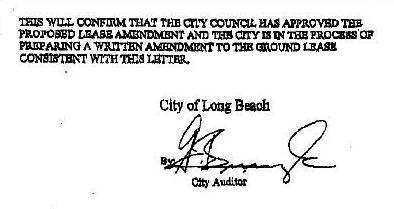 At its March 23, 2004 public meeting, the City Council voted 9-0 to refer the Auditor's rent report to the City Manager, who is currently awaiting a separate report (authorized by the City Council) from the Staubach Co. regarding the Queen Mary. As first reported in January 2004 by LBReport.com, LB City Hall has to date not provided information and documents requested by the California State Lands Commission (SLC) in mid-2003 relating to the Convention and Entertainment Center and the Queen Mary lease. The State Lands Commission also sought in Sept. 2001, and reiterated its request in mid-2003 for, documentation on how LB City Hall proposed to address what SLC staff called diversion of tidelands trust revenue from the Convention and Entertainment Center parking lot funds to other City Hall funds and purposes. In mid-March 2004, SLC staff told LBReport.com that responsive information has not yet been provided by LB City Hall.